CONTENT – Master in Landscape Architecture Barcelona – Universitat Politècnica de Catalunya – 35ª EDITION. The master’s degree programme is organized into the following modules. If you don’t wish to take the entire master’s degree you can sign on one or several modules. The first module of the Masters is The Public Space Project and the duration of the course is six weeks. 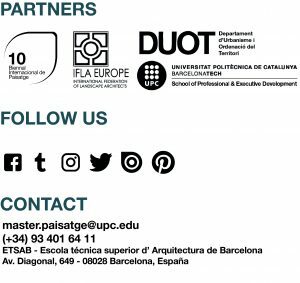 It’s an introduction to the urban context particularly in the public spaces in the city of Barcelona, and addresses the urban planning and strategies in the public space area. The second module of the workshop Public Space Project, which takes place over a period of six weeks. The emphasis is on the strategy of details, looking at things on the small scale found in urban public spaces. First module of the Green Systems Workshop. A six-week course which works with the concept of “perturbations”, analysing and projecting onto damaged areas such as quarries, rubbish dumps or forest fires and following the general theme of the Workshop. Second module of the Green Systems Workshop. A six-week course complementing the first workshop, focussing on the concept of green infrastructure, although at the same time of a different nature with a change of project placement in line with the general workshop theme. First module of the Water Systems Workshop. A six-week course on a grand scale, analysing the environment at approximately 1:5000 and following the general theme of the Workshop. It is the project of sea-front promenades, fluvial areas, wet lands, etc. focussed on how to work in a better way with degraded spaces, trying to increase our knowledge of the consequences of the interaction between water and land on the vegetation, and from the point of view of transformation, management and maintenance. Second module of the Water Systems Workshop. A six-week course working on a much more reduced scale, trying to understand the mechanisms involved in water cycles, and to look at hydraulic systems as a way of reading the land. The workshop is centred on studying those spaces where the water erosion of the land has a prominent role in shaping the landscape. First module of the Tourism Workshop: New Uses for Old Territories. A six-week course dealing with the ever increasing influence of tourism on the economy sector, but also its inevitable relationship with the landscape. Massive tourism, particularly the sun and beach model, has often been associated with property speculation and the exploitation of resources. Second module of the Tourism Workshop: New Uses for Old Territories. A six-week course following the same line as the first module, working in places where the change in the use of the land strongly affects the landscape. Usually working in the same location, emphasising different aspects of the land and achieving projects which are different from the first ones but at the same time perfectly complementary. The workshop is structured around three basic areas of work and investigation developed at the same time: developing a deeper understanding of the complex effects of the tourism phenomenon on land and service industries through conferences by specialists in the field; systematising the study of landscape using conventional and non-conventional methods of landscape analysis suitable for the new generation of cartographers with the use of the Geographic Information Systems; and finally, exploring from inside the project the instruments for planning and management, trying out alternative materials and innovative touristic products. International Intensive Course. A one-week course. The aim of this intensive workshop is to present a personal vision in landscape projection of a professional-teacher of recognised prestige in the field. The idea is to show the students international professional contexts different form the Catalan ones and to widen their local vision and understanding. The theme will be determined by the invited professor, but will be related to and taught in parallel with the first two main masters workshops, the Public Space Project and the Green Systems. International Intensive Course. A one-week course. The aim of this intensive workshop is to present a personal vision in landscape projection of a professional-teacher of recognised prestige in the field. The idea is to show the students international professional contexts different form the Catalan ones and to widen their local vision and understanding. The theme will be determined by the invited professor, but will be related to and taught in parallel with the two secondary masters workshops, Water Systems and Tourism: New Uses for Old Lands. International Intensive Course. A two-week course. The aim of this course is to offer the master’s students the chance to work with recognised and emerging international figures in the field of landscape, both academic and professional. The guest professors will, from their own personal experience, propose the themes and methodologies. The topics will be debated from a wide perspective (projectional, analytical, diagnostic) and coincide with current landscape thinking: the public space project within the limits of the Mediterranean metropolis, the introduction of urban and touristic uses in specific landscapes, for instance the coastline, etc. In the first part of this course the students will undergo an immersion period of 250 hours of work experience in some international or national landscape offices where we have a collaboration agreement. A professional tutor will be assigned to each student and welcome them and supervise their progress in the workplace. At the same time, the students will have to produce a research project or thesis of a critical nature and showing a holistic vision with regards to all the knowledge assimilated throughout the masters and specifically based on the knowledge acquired during the work experience stage. Finally, an oral presentation of their work with digital/visual supports will be evaluated in front of a panel of three or more experts. The Polytechnic University of Catalonia reserves the right to change the program content, which can vary to better accommodate the course objectives.